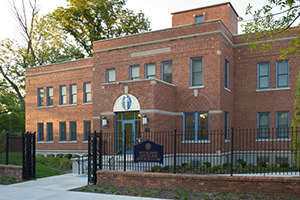 The University of Notre Dame’s Center for Arts and Culture, in conjunction with the Indiana University South Bend Civil Rights Heritage Center, will celebrate South Bend’s past, present and future during a block party at 1045 W. Washington St. in the West Washington neighborhood. The event runs from 10 a.m. to 2 p.m. Saturday (July 18). The celebration will include dances and songs by the Pokagon Band of Potawatomi; performances by the Indiana University South Bend Kick Line, St. Eve and the Vibe; and a Zumba class demonstration from the Kroc Center of South Bend. Food vendors will serve African samosas, cupcakes and paletas, and there will be exhibitions from the St. Joseph County Public Library, The Music Village and The History Museum. The event is free and open to the public and tours of both buildings will be available. Throughout the celebration, the NDCAC and Civil Rights Heritage Center facilities and galleries will be open for tours. The event will include the burial of a South Bend sesquicentennial time capsule that is to be opened during South Bend’s bicentennial celebration 50 years from now. Originally published by Michael O. Garvey at news.nd.edu on July 14, 2015.